All organizations exhibit a unique culture, whether it has been shaped on purpose or not. However, smart managers understand that this culture is a crucial and important reason for the organization’s ultimate success. When leaders decide to implement a system of continuous quality improvement (CQI), they need to understand the role that organizational culture plays so that they can actively shape it. Below are tips for creating a corporate culture that encourages CQI. Culture can be a tricky thing to nail down. Often, organizational leaders will not be able to dictate it, but it still impacts how employees will behave when no one is actively supervising them. It is the paradigm that guides day-to-day decisions and defines what is acceptable and what is not. For instance, if there is litter on the workroom floor, do people stop to pick it up, or do they simply walk by and ignore it? Such simple decisions tell you a lot more about the organization’s culture than any entry you will find in a company’s employee manual. All organizations declare quality as one of their major goals, but how many of them actually take active steps to define quality? 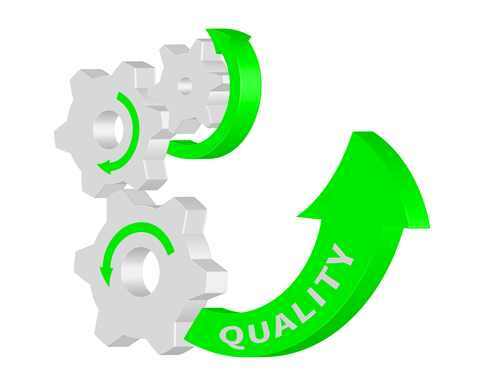 While most people will define quality in terms of the completed product or service that is delivered to the customer, continuous quality improvement demands a more complete definition of the concept. Each process needs to have quality metrics that are fully quantifiable, and should be based on the provision of value while incurring as little waste as possible. Your team should have frequent discussions on quality as part of their daily work process. Corporate culture could actually take a hit if management’s devotion to providing quality centers on appropriating blame to individuals or teams for defects, delays or waste. CQI should not primarily focus on pressuring people to provide perfect results. What it is about is carrying out analysis of the organization’s processes to look for the actual causes of problems. The processes can then be modified to make a quality outcome inevitable. Once best practices for a process have been defined and documented, excellent results are achievable, regardless of who performs the work. Something that business leaders often overlook is the value proposition aspect of their business budgets. If you place a high value on CQI within your corporate culture, it should be reflected in your investment. One form that this investment could take is the purchase of process management improvement technology or hiring of team members whose primary role is to ensure quality improvement within the organization. A culture that ensures CQI will thrive is one that eliminates independent work groups and instead focuses on enhancing teamwork across functions. This is vital since most significant opportunities that arise for continuous quality improvement are as a result of smooth handoff of tasks between business functions. One way that friction can be eliminated from collaborative environments between different teams or functions is through deployment of a common platform that allows access to all task assignments and documents to everyone within the organization who requires them. The primary criteria that should be looked at during the hiring process is a candidate’s attitude and aptitude for continuous improvement. Although it is not absolutely necessary for everyone hired by the organization to have direct past experience with organized CQI, it is vital that they can demonstrate a willingness to participate in, and embrace, positive change. An important step in the development of a culture of continuous quality improvement is the need to announce the successes achieved. If the improvements made result in lower costs, fewer defects, happier customers and other positive impacts on the business, you should share the good news. Whenever people feel that their efforts bear fruit and are being recognized, they become more engaged and the cultural values of the organization are strengthened as a result. The post Building a Culture of Continuous Quality Improvement appeared first on Shmula.